Bill O'Reilly was not the least bit impressed with the headline on the article I wrote about his interview with Donald Trump yesterday. 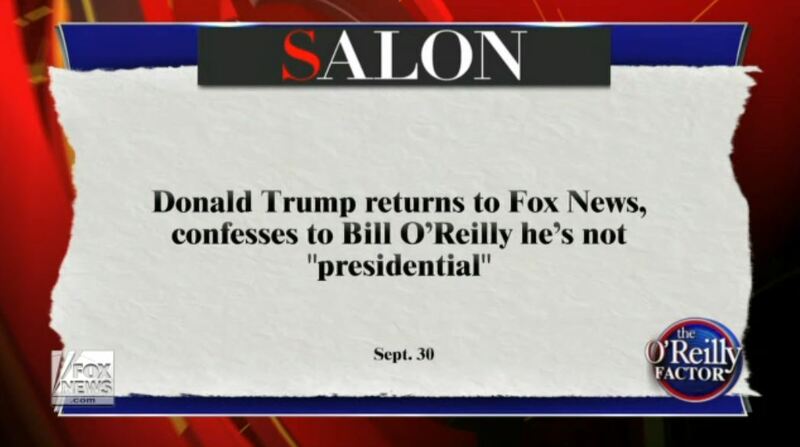 The headline rather staidly read "Donald Trump returns to Fox News, confesses to Bill O'Reilly that he's not 'presidential,'" referring to a moment in the interview in which O'Reilly asked Trump if calling Florida Senator Marco Rubio "a clown" was "presidential" and Trump replied, "I don't think so." As evidenced by the composite screen capture accompanying that story, O'Reilly found Trump's response amusing -- but apparently Tuesday night's laughter turned into Wednesday night's tears, as he claimed that that headline is everything that's wrong with journalism today. "A new Gallup poll says that just 40 percent of Americans trust the media," he said, "and the reason is deception. After last night's interview with Donald Trump, the far-left hate website headlined this." "That is a lie," O'Reilly said. "Trump never said anything close to that." Except for when he explicitly did, in answer to O'Reilly's question, but that's neither here nor there. "Now, there are scores of 'Salons' on the Internet," O'Reilly concluded. "Crazy, ideological websites that simply make stuff up. Then, some traditional media pass the garbage along to you and pick it up. Smarter Americans have figured out the con -- thus the polling results."